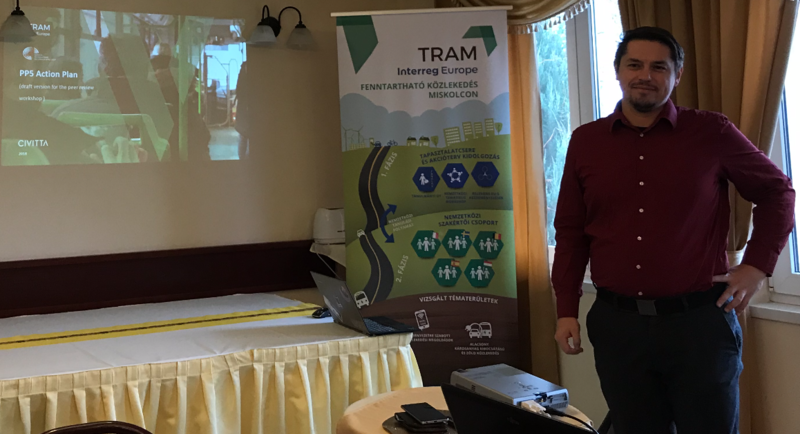 As the first phase of the Interreg TRAM project approaches its end we highlight a few events from the last few months. The first of these is the peer review workshops series that Henrik Ny participated in on November 20-22 in 2018 in Miskolc, Hungary. Three of the five project partners presented their draft action plans within the project and gave each other feedback. This included the Region Blekinge from Southeast Sweden, the Municipality of Miskolc from Hungary and the Northwest development Agency from Romania. Henrik is the technical expert within the TRAM project for Region Blekinge. He attended together with Mattias Andersson from Region Blekinge. The peer review workshops resulted in many good suggestions for improvements. Figure 1. Reinhold Stadler while presenting the Romanian action plan (picture by Henrik Ny).